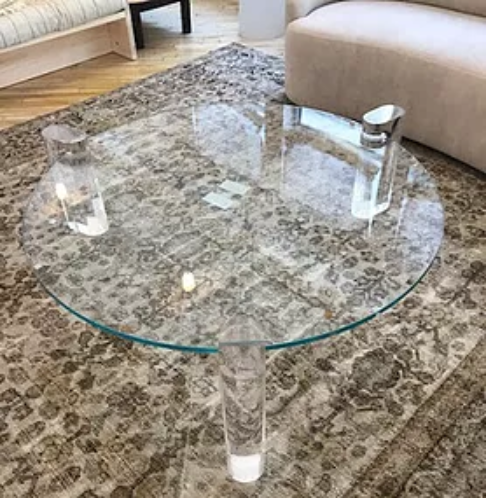 We fabricate glass table types in various sizes and shapes, whether a simple rectangle or diameter, or a custom shape to fit a unique piece of furniture. We can fabricate simple shapes with dimensions only, while more complicated shapes will require templating. Most glass table tops that sit on top of wood tables are clear 1/4" glass, while glass tops that are only supported by a base or perimeter frame are heavier 3/8" thick to 3/4" thick glass. A variety of tinted glass options are also available. A variety of finished edges can be produced for your table top. The least expensive option is a “seamed edge” which removes the sharp edges of the glass but otherwise leaves the edges of the glass unfinished. A “polished edge” is a ground or brushed edge that provides a more uniform appearance while the “high polished edge” provides a uniform and clear glossy edge. Beveled edges from 1/4" wide to 2" wide are also available depending upon the thickness of the glass.